With water on every side, Dauphin Island is a water lover's paradise. The natural setting of Dauphin Island is both beautiful and inviting. 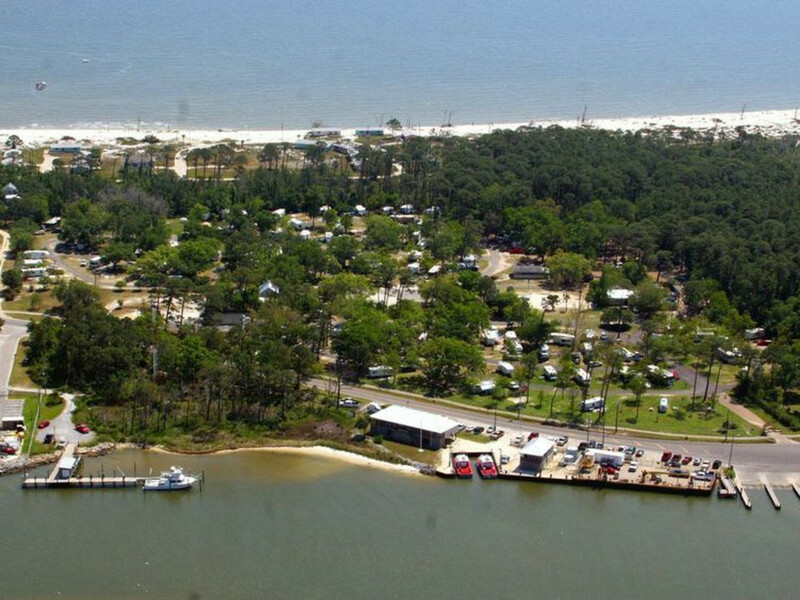 Camping on Dauphin Island is a unique experience where you can enjoy the Gulf of Mexico and Mobile Bay. 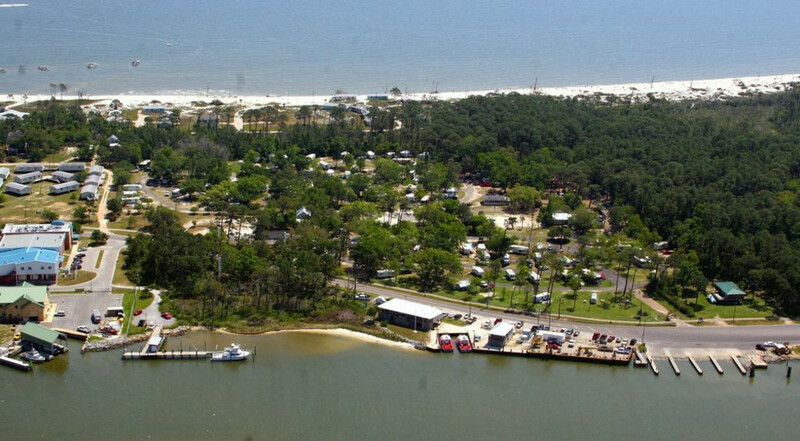 Dauphin Island camping is an adventure the whole family can appreciate. It's pristine white sandy shores is located on a barrier island near the mouth of Mobile Bay. 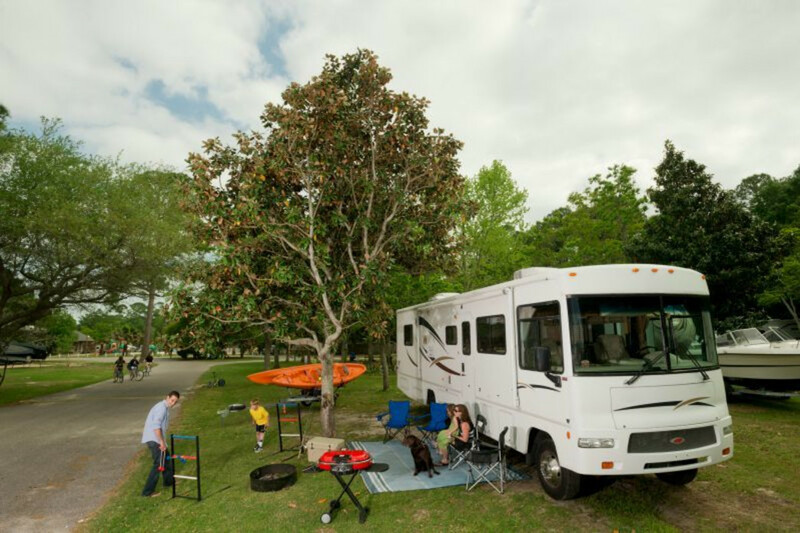 Surrounded by the Gulf of Mexico, this campgrounds is one of few that offers dauphin sightings on a daily basis. There are 151 sites, 99 of those are full hookup service. RV spots do not have concrete pads and roads are also not paved. Stocking up on food and supplies before you get to the island is wise, shopping is limited. Mosquitos and other flying insects can be a problem, bring plenty of repellant. Although sites are not waterfront, the beach is only a short walk away. Bathrooms and the bathhouse are located in the center of the campgrounds along with the playground, picnic pavilion, and basketball court. This campground has several unusual features that makes it special. The Audubon Bird Sanctuary is adjacent to the campgrounds and within walking distance. It includes 137 acres of maritime forests, marshes, dunes, two lakes, Alligator Lake and Oleander Pond. The sanctuary includes a swamp and beach yielding an abundance of bird sightings. Of the 445 Alabama bird species, 95% have been documented on Dauphin Island. Fort Gaines is a one of the Eleven Most Endangered Historic Sites in America. It’s been guarding Mobile Bay for 150 years. When French explorers landed on Dauphin Island they discovered human skeletons and named it Massacre Island. The remains were part of a Native American burial mound which had been opened by a hurricane. Shell Mound Park on Dauphin Island is one such mound that can still be seen. Dauphin Island Sea Lab is an educational estuarium and aquarium. Kids will love petting the stingrays in the touch pool. Those who appreciate a true nature experience will love it here. Birds of many species, fish, and dolphins are a few of nature's wildlife that you will get a close up look at. History buffs will enjoy touring the adjacent fort and battle grounds. Paddlers and fishermen/women will definitely find Dauphin Island to be a very special place. From Gulf Shores: Beginning from the intersection of AL 59 South, (or Gulf Shores Parkway), and AL 180 West Fort Morgan Road. Traveling 20.3 miles along AL 180 West Fort Morgan Rd. take the Dauphin Island - Fort Morgan Ferry to Dauphin Island, (tolls are included). After landing on Dauphin Island, drive along taking a slight left onto Bienville Blvd. Dauphin Island Park office is at 109 Bienville Blvd. From Mobile, AL: Take I-10 W and AL-193 S for 38.6 miles to Bienville Blvd in Dauphin Island. Reservations are made via phone only. (251)861-2742. Minimum 2 night stay. One boat/wave runner per registered camper. Only 1 tent/RV per site. Two cars per site. 1 week tent occupancy limit. Pets allowed. Firearms, fireworks, or other potentially lethal devices are not permitted.